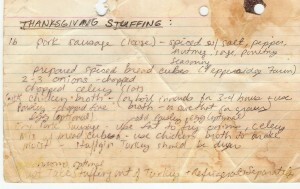 Thanksgiving Memories and Leftovers: Turkey Burritos! Thanksgiving is one of those holidays where bits and pieces of memories from years past weave their way through my mind creating a rich Thanksgiving tapestry of sorts. So many stories come to mind and whole scenes from different eras in my life and lessons learned. When I was a young kid, Thanksgiving was not an extended family affair. This was because my parents were both European, and not only was our extended family too far away, they also didn’t celebrate Thanksgiving. My parents, who became US citizens of their own right, were dedicated to all American Holidays, however, and to make the occasion grand they always arranged for a traditional Thanksgiving feast and for us to share the day with family friends. The morning was always dedicated to cooking, the afternoon to eating and the balance of the evening to playing games. Pie and a walk generally happened at some point during the evening festivities. In those days, the ultimate goal was to stay up long enough to have a turkey sandwich at midnight! Beyond the basics of the day, my memories of Thanksgiving also come with thoughts of gratitude and grace. There have been many Thanksgivings where one or another person held us spellbound as they recited their version of grace, or where they shared their grandmother’s favorite grace, or made up their own, or where we all contributed and reflected on what we were thankful for. But I remember one Thanksgiving learning about another kind of grace too. On this Thanksgiving we had been invited to my Auntie Jeanie’s house (she was a beloved adopted “auntie”). . . and now just thinking of her immediately makes me recall the moment, while she was in the process of dying, that she asked me to speak her eulogy, and me in reflecting on her beautiful life and it’s undeniable impact on me and those around her, summed her life up in two words: “dignity and grace.” Auntie Jeannie was lovely and charming through and through. On this particular Thanksgiving, as we all sat down to dinner, we became aware that a Thanksgiving Day travesty had occurred: the turkey was burned to an absolute crisp. Auntie Jeannie, however, did not fret for even a second. She never apologized. She never worried about her cooking or what we all might be thinking or what we were going to do without a turkey. She simply put the charcoal black turkey on a beautiful serving platter in the middle of the table and said simply “Oh, it looks bit black”. Not a single additional word was said. And, with that leadership, we all took heed and turned the focus back to each other and the conversation to more interesting topics. There was plenty of other food and we feasted gloriously, turkey or not. To me this simple act captured the essence of grace. She knew instinctively what was important that day–and the fact that she had burned the turkey was not the most important thing, not even worthy of further comment really. We were, after all, ultimately most grateful to be spending the day together and enjoying each other’s company. Now so many years later, our Thanksgiving feast has had to change to accommodate wheat free, meat free, sugar free dietary constraints. Thus many of the stalwart favorites that seem to be the cornerstones of a Thanksgiving feast are not options–is this a travesty? Not a chance–no matter what ultimately ends up on the table, we get to spend the day together cooking and conversing – what could be better? I don’t plan to write out all the recipes–just the gluten free vegetarian stuffing, (But, if you are interested, feel free to contact me for any of the recipes above) It was a fabulous feast! Old stories were told and new ones were born . . . .
· everything! – all mixed up in one big skillet. After heating and mixing all the leftovers in one big skillet, you wrap it all up in a tortilla (corn or flour) and add a little homemade salsa (tomatoes, onions, and jalapeno) and voila! Yum!!! – McCandless Family Turkey Burrito leftovers — perfect peasant cooking food. So, take a look in your fridge – are there still Thanksgiving Day leftovers? Forget about Turkey soup – make Turkey Burritos. You will love them. And last but not least my mom’s stuffing recipe, faithfully recorded and, as I mentioned, showing much love from Thanksgivings past . . .